Mission specific discharge and LED moving lights from Martin, a HARMAN Professional brand, featured widely on a number of television shows in the lead-up to the Christmas season. Many of these have been sourced from Nick Edwards’ new TV lighting rental company, Version 2. One of the most experienced adopters has been Stuart Pring, who recently lit Robbie Williams Radio 2 in Concert show and The Brits Critics Choice Awards, for Brit TV. A veteran of Martin lighting solutions over the past 15 years, in recent times he has favoured the MAC Aura range, RUSH Par and MAC Viper, sourcing inventory from Edwards’ various companies along the way “Nick’s support is second to none,” he says. “He understands the budgetary constraints we work to and is always helpful in offering rigging suggestions, plus his equipment is always immaculately prepped.” Pring’s first port of call is generally the MAC Aura. “It is the best colour wash available — it has great colour mixing and a fantastic zoom facility, which can help to instantly change a look of a stage.” He used another Martin ‘all-in-one’ fixture, the Axiom Hybrid, for the Robbie Williams Radio 2 in Concert at Maida Vale’s MV3 studio. For the Brits Critics Choice Awards, Pring benefitted from having prior experience of working at Abbey Road Studios. “You have to respect the fact that this is a sound recording environment,” he notes. “In Studio 1 where we filmed Brits Critics Choice everything has to be rigged from the floor, which I tried to do with as few stands in shot as possible, while showing off the Abbey Road location.” His goal within the large space was to produce a design that would work for three bands each playing two numbers, with diversity in the lighting for each band. “The Martin fixtures helped me achieve this through the simple ability to change colour and gobos,” he said. 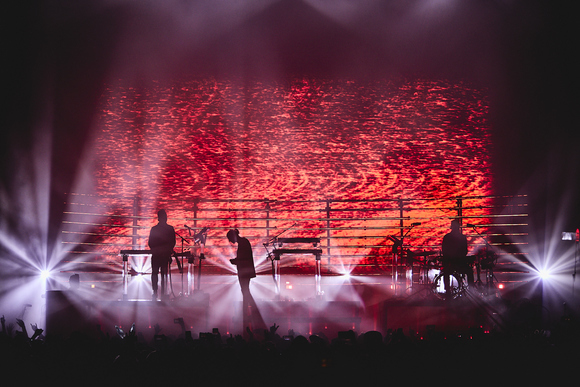 Using lighting largely for projection he deployed Martin RUSH Par and MAC Viper on the floor around the band, to project colour and animation gobos onto five Dedolight PanAura octagonal soft lights. On each PanAura from the same distance he placed a MAC Viper. “By using a combination of rotating gobos, prism and full zoom I managed to fill the silks of the PanAura with gobo textures, and by playing with the focus I could really create some great abstract effects,” he said. Summing up his product selection Stuart said the Axioms had enabled him to offer beam lights as well as spots and add character to the show. 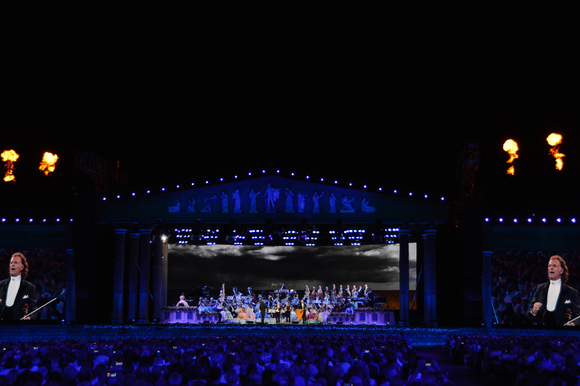 “I wanted something that could be used as backlighting for the many band members as well as to create big beam looks to enhance the overall show design."